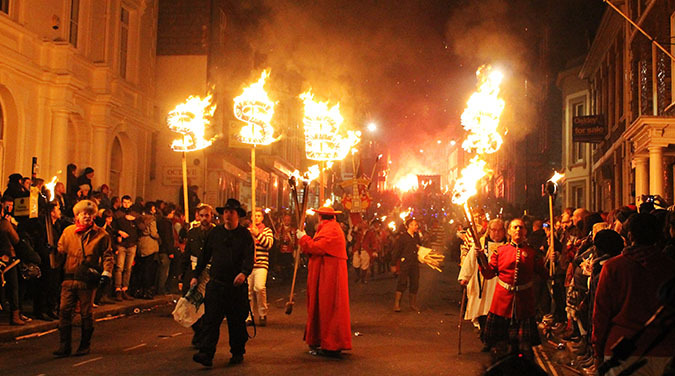 Welcome on a student tour to Lewes Bonfire Night, this tour is available only for Brighton & Hove students. 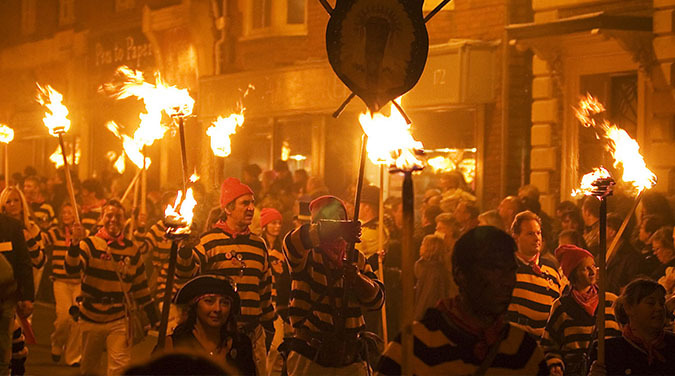 Lewes Bonfire night which is one of the biggest firework nights in the country - it's the best place in England to celebrate this national holiday commemorating the day when the British parliament wasn't blown up, and the subsequent death of a Catholic terrorist named Guy Fawkes for planning to do it. 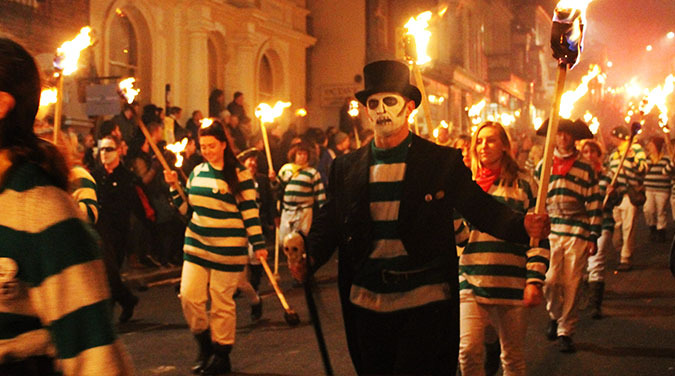 Everything seems a bit foggy in Lewes, where the parades and bonfires fill the air with smoke, giving the narrow streets of the city a ghostly feel that just might take you back a few years. The torch lit priocessions around the street conclude at one of 5 difefernt bonfire sites and conclude with a spectacular fireworks display. Trip departs early evening by coach and returns after the fireworks late evening. Advice for potential visitors, read carefully! This will be a long evening and may be cold or even wet. Make sure that you wear appropriate clothes and footwear (firesites may be muddy). 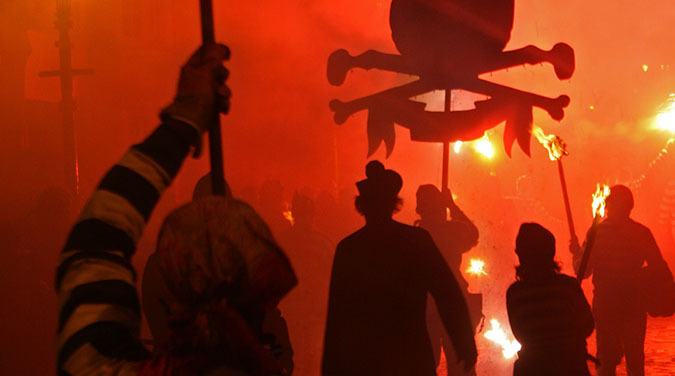 Sparks may fly from the bonfires and from the torches in the street processions so wear old clothes and waterproof shoes. Do bring a reasonable amount of money. You may wish to buy food and drink from the vendors and to contribute to the collections for charity which take place during the processions. There are places around the procession route where you can get food and drink during the event. The first of the many processions starts at 5:10 pm and finish about 11pm. However, because of the pressure of crowds in the streets, the proceedings are often delayed and no timings are guaranteed. When a procession approaches please clear the road and remain on the pavement until the procession has completely passed. Never bring fireworks with you! The police will very quickly remove you from the celebrations if you are seen to be letting off fireworks yourself. 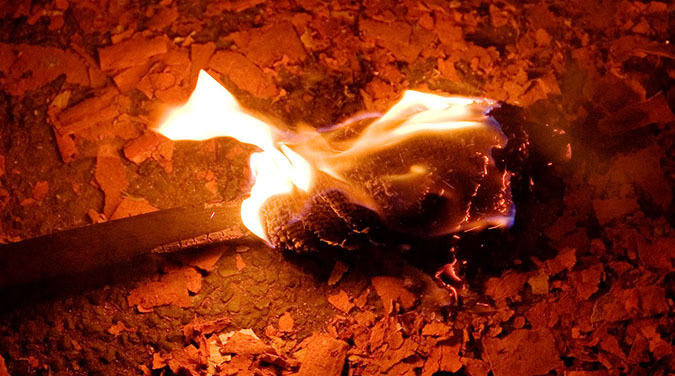 Please do not pick up discarded torches in the street.